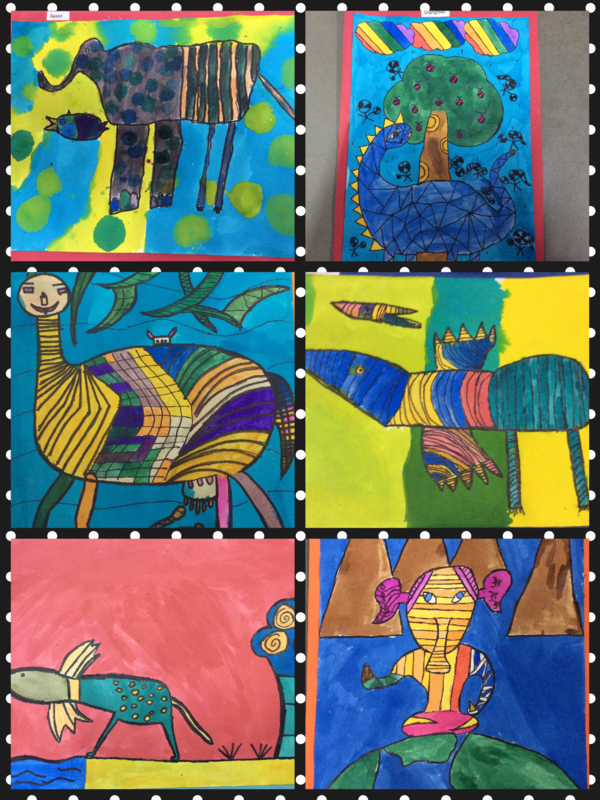 The students of PYP 5 researched the lives and art of the Gond people from the state of Madhya Pradesh in Central India. The Gonds are a community of highly visual people. They surround themselves with their art, which traditionally is painted on the mud floors and walls of their homes. Art is a form of prayer for them, and they believe that good fortune befalls those whose eyes meet a good image. PYP 5 also studied Warli art from Maharashtra India, and are currently studying Australian Aboriginal art in connection with their unit on Human Migration under the transdisciplinary theme “Where we are in place and time”. Their inquiry has taken them through observation and analysis of the three art forms in terms of the content, the techniques and the media used. 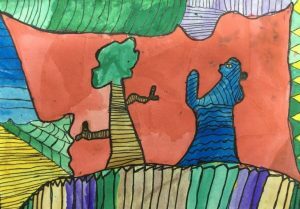 The students then went on to create their own pieces of work in each of the styles, writing a story to explain their perspectives and thinking. Once upon a time, a man was migrating to find a new home when he stopped in front of a tree to pray. The spirit of the tree heard his prayers and said ” young man what is it you seek”. The young man thought about it and said “I wish to live in a world filled with patterns”, the spirit said “very well”. The young man awoke in his new home and lived a happy life filled with patterns. 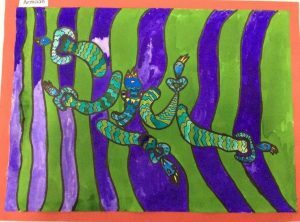 This is my Gond Art. Gond Art is found in Madhya Pradesh, Andhra Pradesh, Maharashtra, Chhattisgarh and Odisha. Gond Art uses bright vivid colors . This piece of art is popularly drawn on festivals. Gond Art usually has a mythical story backing it. 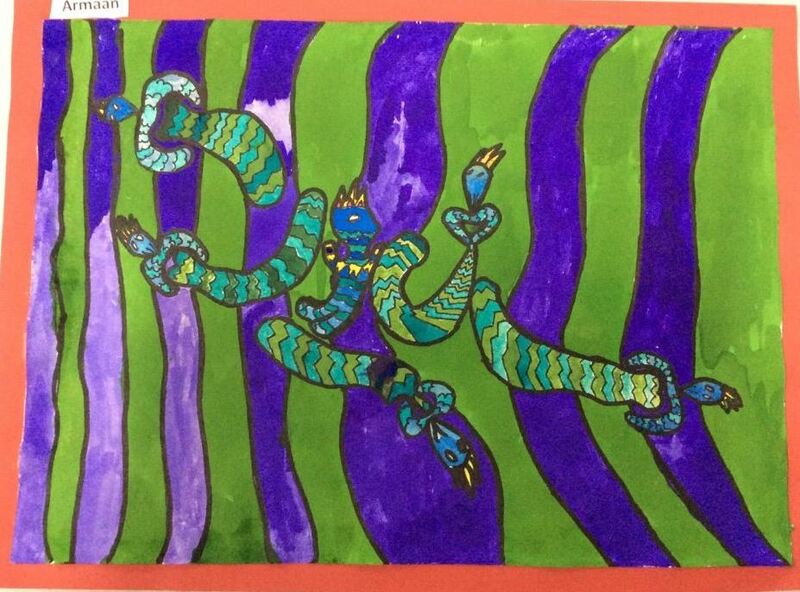 My story is about Krishna getting protected from the cosmos by creatures which are half-human and half-snake. An elephant living in the sky, a fish living in the grass and a flying creature living in the pond. You might think I got my animals mixed up, but no, let me tell you the story. In the mysterious land where the sun shone at night and the moon glowed at day, there lived an unhappy elephant. He was sad since every day when he went to eat in the grass he saw the MAURM. The MAURM was one of the most common animals in the land they lived in. It looked like a winged snake with the beak of a bird. The elephant envied its ability to fly above the clouds. 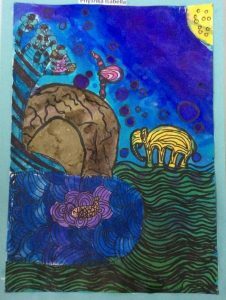 Little did he know that the MAURM had a huge jealousy for the fish that swam at the depths of the lake, not knowing how much the fish wished to roam on the land that the elephant walked. One day they all decided to tell each other what they wished they had. They met up at the cave to discuss the problem. The fish went by a stream that led there. They agreed they should go in search of an owl, the wisest animal there. They migrated for days. The MAURM carried a water filled bucket with the fish in it. When they got there the owl was eating a squirrel. They told him the problem. The owl asked the others where they came from and they all had to go back. Once they were there the wise animal waited for night. Then she looked at the stars and told them that one of them contained a spell which would switch their bodies. They had only one chance to guess which was the right one and they had to touch it at the same time. They looked at the shimmering stars and chose a dull one since they thought it showed that appearances can fool others. If they choose the right one then that rule would be applied. It was within the elephants reach and the MAURM could of course fly but there what is the matter of the fish. They would have to carry him in a bucket again. He would have to jump just at the right time or they would all be stuck the way they were. As soon as the fish landed they would have to push it back in the pond. They went up as the fish completed his leap of faith. He did it!!! They were all happy. The owl decided to stay as she liked the snake tree there and they all lived happily ever after.